Week 1 (April 1-9) : Sign up post - let's begin our journey! What immediately comes to mind when you hear "Nobel Prize winner for literature?" Why? When I first hear "Nobel" I immediately think "intimidating" because I associate it with lofty, noble and highbrow ... and thus hard to read, or worse, yawn-worthy. But my attitude towards Nobel winners has definitely changed over the years. 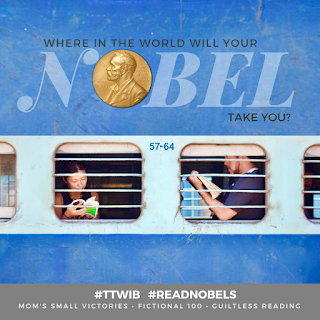 I've been reading Nobels, albeit very slowly, since 2007. 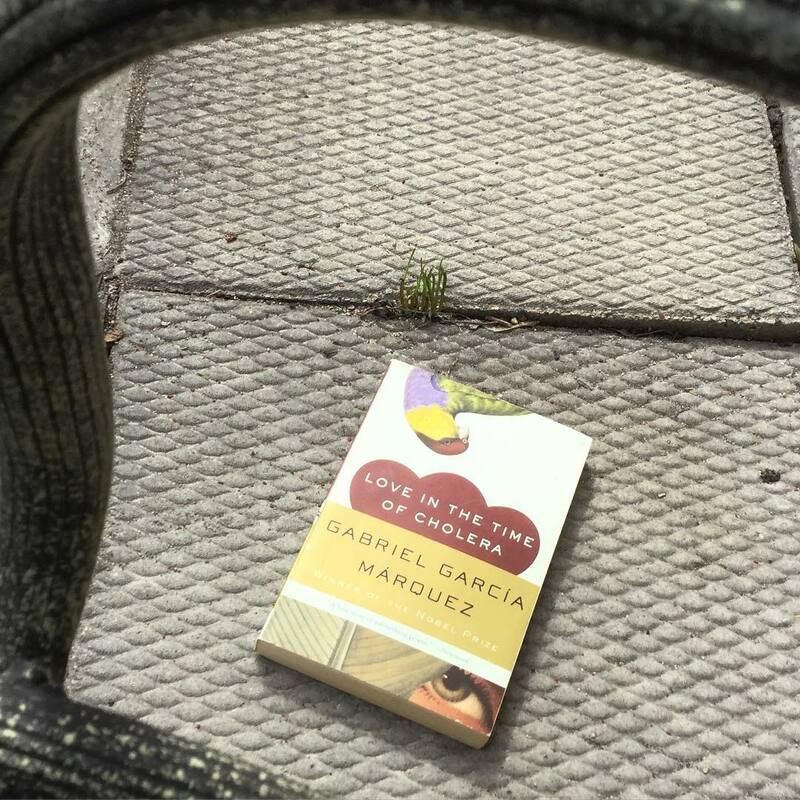 I didn't really set out intentionally to read Nobel prize winning literature but I remember reading (and loving) Gabriel Garcia Marquez's 100 Years of Solitude and naturally tried to find out more about him. In the course of doing so, I became quite intrigued by the many names in the list of winners - some I was familiar with, others that I had never heard of. The winners come from all around the world and since the prize is awarded to a person for their body of work, as opposed to a single work, the list of potential books to read is immense. Some of my favourite books are listed in this post. Which book did you choose? Who is the author / when did they win the Nobel Prize / nationality? Why did you pick this particular book? What other authors / books did you also consider for this challenge? I was having such a hard time deciding which author and book to read. If you follow me on Instagram (@guiltlessreader), you probably saw me hemming and hawing between two Alice Munro titles -- View from Castle Rock or Too Much Happiness. Alice Munro, a Canadian author, won the Nobel in 2013. I have read both books mentioned but have left them unreviewed. I attempted to reread earlier this year View from Castle Rock but never got beyond the first short story; since I couldn't build up my momentum, I just gave up. Too Much Happiness also deserves a reread but I remember how sad the stories were and honestly, I don't think I can handle them right now. Anyway, in true mood reader form, I decided I needed my yearly dose of my old-time-favourite Gabriel Garcia Marquez. I can't help but be excited by even the mere prospect of reading his books! I kind of hear a collective groan amongst you -- yes, I know I am sooo predictable. 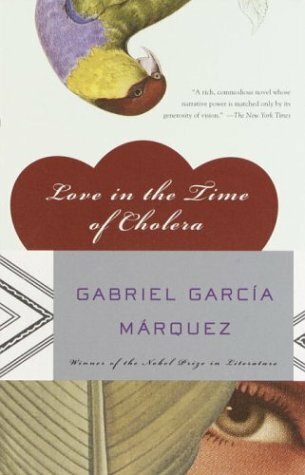 About Love in the Time of Cholera by Gabriel Garcia Marquez*: In their youth, Florentino Ariza and Fermina Daza fall passionately in love. When Fermina eventually chooses to marry a wealthy, well-born doctor, Florentino is devastated, but he is a romantic. As he rises in his business career he whiles away the years in 622 affairs--yet he reserves his heart for Fermina. Her husband dies at last, and Florentino purposefully attends the funeral. Fifty years, nine months, and four days after he first declared his love for Fermina, he will do so again. 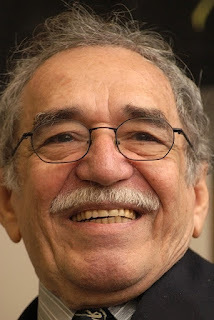 Garcia Marquez won the Nobel Prize in Literature in 1982 "for his novels and short stories, in which the fantastic and the realistic are combined in a richly composed world of imagination, reflecting a continent's life and conflicts." I've made him my gold standard for the genre magical realism. This story is set in Márquez's homeland of Colombia, a Latin American country. The weather is gorgeous and while putting around outside with the last vestiges of winter still here and there, I snapped a photo of Love in the Time of Cholera. Where am I? Obviously I am sitting in the lawn chair, trying to make photo all artsy fartsy. Want to join in? All it takes is one Nobel for the entire month of April! Check out the Sign up post for details and lots of resources.